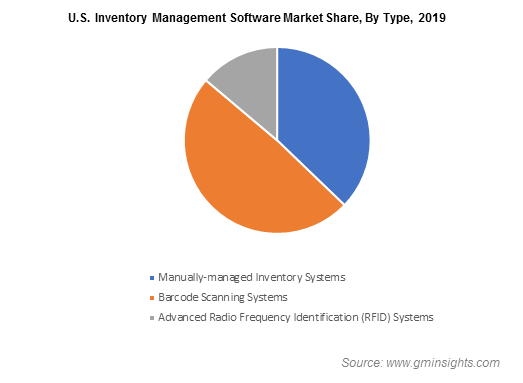 Inventory Management Software Market size was estimated at over USD 2 billion in 2017, growing at a CAGR of over 6% from 2018 to 2024. 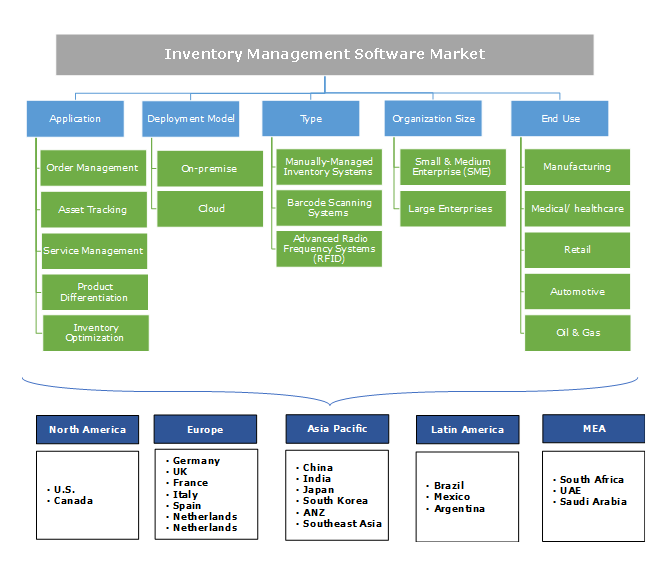 The inventory management software market is projected to exhibit an accelerated growth between 2018 and 2024 due to the growing trend of omnichannel retailing, increasing adoption of smartphones and other mobile devices, a rapidly evolving global e-commerce landscape, and the increasing need to control and reduce supply chain inefficiencies. By offering an omnichannel shopping experience, retailers are designing a cohesive user experience for their customers on various platforms such as physical stores, online stores, and social media channels. Another key factor facilitating the market growth is the rising need to control inventory shrinkage in supply-chains. According to the National Retail Federation’s National Retail Security Survey (NRSS) on retail theft, global retailers incurred shrinkage losses amounting to USD 49 billion in 2016. The four major sources of inventory shrinkage in the retail industry include shoplifting, employee theft, supplier fraud, and paperwork errors. As inventory shrinkage can significantly affect profit margins of SMEs, there is an increasing demand for modern inventory management software systems, especially from the retail sector. The barcode scanning system held a majority market share of over 50% in 2017 due to the extensive adoption for tracking inventory movement across the supply chain right from manufacturing facilities till the customer delivery. As the technology eliminates manual errors in record keeping for warehouse processes, it is being widely adopted across medium and large-scale businesses. The system allows organizations to process large volumes of items with the ability to pull the data directly from POS systems and cash registers. The advanced radio frequency system is projected to exhibit the fastest growth between 2018 and 2024 due to the capability to automate end-to-end warehouse control. These are typically used by large organizations that move thousands of orders on a daily basis. The technology is ideal for the implementation in environments, where the real-time inventory tracking is critical. The order management application dominated the inventory management software market in 2017 due to the increasing uptake by businesses for effectively managing incoming orders from various channels. Modern order management solutions involve limited or single agents for handling end-to-end activities for customers. There is a scope for additional channels to place orders and resolve the order issues. Also, the automation in such systems enhances the overall process and facilitates integration among different tools for quick order resolution. These capabilities are expected to favorably contribute to the increasing uptake of order management systems over the forecast timeline. The on-premise deployment model held the majority market share of over 70% in 2017 due to the large-scale deployment of the traditional on-premise model by enterprises. However, with the growing popularity of cloud technology for deploying and managing resource-intensive inventory management workloads, the cloud model is projected to register an accelerated growth with a CAGR of over 9% between 2018 and 2024. Cloud providers plan for contingencies related to system breakdowns or failures by scheduling backup servers with all the data intact. Such provisions ensure reduced downtime and continuous availability of all the critical business applications. These benefits are expected to drive the uptake of cloud-based inventory management software over the forecast timeline. The SMB segment accounted for a significant share of over 70% in the inventory management software market in 2017. By adopting modern inventory management software, SMBs can streamline their storage and distribution operations to gain a competitive advantage over other similar businesses. Also, the system allows them to remain highly agile for flexible supplier management. By using inventory management software, these companies can easily switch order and suppliers at the touch of a button. This enables SMBs to make their product lines as adaptable as possible. The retail sector is expected to dominate the inventory management software market throughout the forecast period and secure a market share of over 40% by 2024. With the advent of e-commerce, the growth in the retail sector has been impressive due to the advantages of economies of scale and business expansion across the B2C (Business to Customer) and B2B (Business to Business) levels. Also, due to the increasing retail shrinkage levels in SMBs as well as large organizations in the sector, the need for effective inventory management systems is being increasingly recognized by retailers around the world. North America held a dominant share of over 40% in the inventory management software market in 2017. The majority share is attributed to a rapidly expanding e-commerce landscape in the region, a robust manufacturing sector with increasing adoption of industrial IoT after Industry 4.0, and the availability of an extensive cloud infrastructure. According to the U.S. Department of Commerce’s International Trade Administration (ITA), the manufacturing industry in the U.S. received Foreign Direct Investment (FDI) amounting to USD 1.6 trillion in 2017. In 2016, the manufacturing sector contributed nearly USD 350 billion to the U.S. GDP. Europe is the second-largest market for inventory management software and is expected to secure a market share of over 20% by 2024. The retail sector is one of the major sectors in the European Union (EU) economy with almost 1 in 10 people employed in more than 3.6 million retail companies. Also, the demand for solutions is likely to increase consistently over the forecast timeline in the automotive sector in the region due to the surge in the production of electric vehicles (autonomous vehicles) and passenger cars in response to the rising global demand. The inventory management market is highly fragmented due to the presence of several multinational and regional players. The major global players such as Oracle, SAP, Microsoft, and IBM dominate the market with a major market share and extensive global presence. These companies invest heavily in the R&D to develop more robust inventory management solutions and innovate their existing products on the market. For instance, Zoho One is enabling a new set of capabilities that bridge the gap between different departments and roles within an organization. Similarly, the company has recently introduced its new Artificial Intelligence (AI) solution, Zia, which will assist organizations in resolving customers query by using AI capabilities. Also, the major companies are focusing on strategic acquisitions and mergers to facilitate the inorganic growth and expand their technologies capabilities and product lines. Some of the key players operating in the inventory management software market are SAP, Oracle, Zoho, Microsoft, Fishbowl, TradeGecko, Ordoro, Brightperal, Stitch Labs, Acctivate, Wasp Barcode Technologies, Dapulse (Monday.com), Orderhive, KCSI, Handifox, Dearinventory, Megaventory, Veeqo, eTurns, SkuVault, Sage, and Manhattan Associates. Before the industrial revolution, inventory management was very primitive, and the demand forecast was based on manual counting of the sold units every day. After the industrial revolution, mass production and efficiency became the prime goals of businesses, leading to a transformation of inventory management software to accommodate huge volumes of inventory flowing across supply chain networks. With the subsequent development of barcode and RFID technologies, the inventory management software has evolved to offer analytics-based inputs for demand forecasting to the enterprises for optimizing their inventory levels and avoid over or understocking of inventory, which can hold up a significant amount of capital.